The boat accosted right on the beach, halfway out of the turquoise water that already announced the colors of our stay on “Gili T” (as tourists call it). The first thing that struck me was the complete absence of motorized vehicles on the island. Just a few steps out of the sandy beach and we were already walking on the main road that circles the whole island over just about 6.5km of circumference. 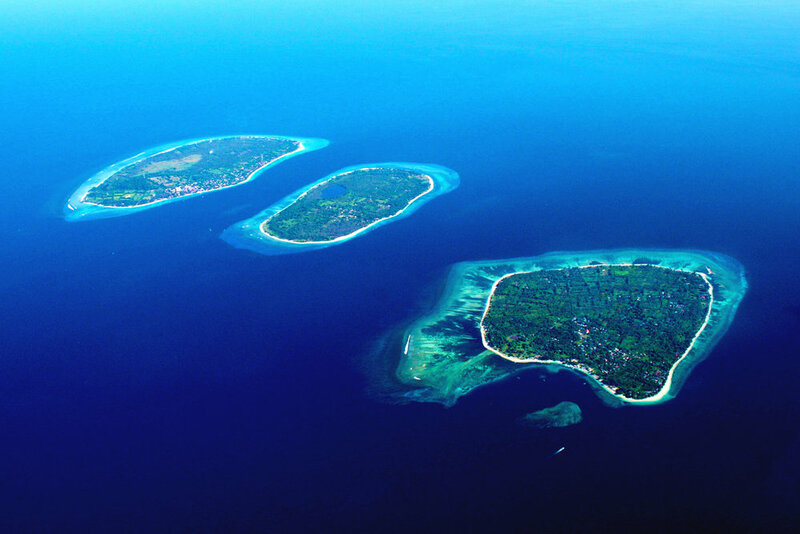 With such a small size, it’s hard to believe that “Gili T” is the largest of the three islands. We walked on the main road in search for one of the scubadiving schools we had researched online before getting here. Out of close to twenty dive centers, we retained two of them based on their reviews: ‘DSM Dive Gili Trawangan’ and ‘Vila Ombak Divers’. The former center being closer to our current location, we started our investigation with this one. Right off the bat, we must have waited 15 minutes before someone came to talk to us. When they finally did, they started with asking us to move our luggage to the locker area before even mentioning any form of greeting. A tall and skinny blond man finally came to us and insisted on sitting us down on their couch before starting his sales pitch. A technique often used to close a deal is for the salesman to place himself on a higher position than the potential clients. Being taller, sitting on a higher chair or standing while your clients are sitting creates a psychological advantage most of the time in any form of negotiation. We kind of broke his routine when we insisted on stretching our legs since we were sitting on a boat for the past two hours... oops! Neither a smile nor a joke were cracked by the Belgian owner as he was explaining his terms and conditions to us. That was enough for Cath to go and investigate the next dive center. Normally, it’s a common French stereotype that they complain all the time and about everything. I had no idea that Belgians could also express dissatisfaction so openly as they were talking about the behavior of locals toward the rare species they crossed paths with that morning. But, let’s not generalize and keep this case isolated. Have you ever tried to sum up someone’s idea into one sentence to make sure you understand what they meant? Then, have you ever had this person disagree to your summary despite using the same terms by bringing a small nuance that doesn’t really change the main idea being expressed? That’s basically what happened as we were having a discussion about the echosystem around the island. In this behavior I saw someone who’s ego was so dismeasured that he won’t let someone else have any of his glory as little as having his thoughts successfully summarized by someone else. Me: In general, how is the relationship between expats and the locals? When the girls finally came back and decided to go with the other school, he just stood up and went inside the school (probably to his office crying) without even saying goodbye or good luck. As we walked out of the center, Cath explained to me that it took more time until they came back because they successfully managed to book a very nice accomodation. She added that it was really day and night between the two centers and that we would be much happier diving with the good people of ‘Vila Ombak Divers’ - a statement I had no difficulty to believe whatsoever after what I’ve been exposed to in sixty minutes only. ‘Vila Ombak Divers’ was a center owned and managed by a French man and his Chinese life and business partner. With his imposing height and strong belly, both Gilles’ figure and personality resembled the one of a bear. He was the sweetest man and obviously loved his business. During the few days knowing him, he never missed out on an opportunity to share his passion with us through countless conversations. With his team of well-trained instructors and friendly (but very safe) approach to recreational scubadiving, we definitely made the best choice by selecting their school over the other group of slotty noses. Later that day, Sophie (who was in charge of researching the dive centers) remembered sending out emails to the two schools. At that time, she did not make the connection as to which school had replied with which message. The first answer was a very dry automated reply explaining the terms and conditions for signing up to a course. The second was a warm and personalized reply with the exact detailed information we asked for. Looking back at those two very different models, it is now very easy for us to associate each message to a dive center. On an afternoon that Sophie and Joanie were busy studying, Cath and I decided to go for a long walk around the island. Before starting our hike, we stopped at the Villa Ombak Diving school to ask the owner which sight not to miss on our path. There was nothing much to mention. It took us a little under three hours to complete the full circle. On our path, we crossed a few resorts, some nice beaches, a handfull of local restaurants and locals selling arts and crafts. As expected, nothing much to see and nothing much to do at midday on Gili T. That did not stop us from having fun while telling each other funny stories as usual. Among the few things we could do, we did a photoshoot by the beach on one of those wooden swingsets placed a few meters into the sea. We had a lot of fun there while noticing without any exaggeration that the water was warm enough to take a bubble bath in it. We were told later that this uncommon situation is due to Mount Agung - the famous volcano located on the Northeastern part of Bali that is about to errupt. Towards the end of our tour, we stopped by for our daily tradition: a freshly blended fruit smoothie. Our detox cure to ensure we get our daily dose of vitamins (and to wash out the Bintang out of our system). Finally, on the last stretch of our hike we stopped at a small booth to purchase some handmade bracelets. Other than that, nohing to signal on this tiny island at broad daylight. Most of the activities take place at night as the island turns into a nightclub under the moonlight. There was the Gili T we have been told about and I must say, for better or for worse, it really lived up to its reputation. During one of the last days on the island, we kicked off the evening by having dinner at a vegan restaurant a friend of mine had told me about by the name of “Pituq Café”. The dining area was an open-air patio with tatamis on wooden structures as livingrooms for parties of six. The vegan experience is really brought to a whole new level when fresh exotic fruits and vegetables are factored in. My personal recommendation is the Jackfruit Curry - a large bowl of jackfruit cubes bathing in a rich coconut and yellow curry sauce, served with steamed rice. Absolutely delicious! Cath and I left this place of perdition and walked by the beach in search for a more relaxing venue to unwind before calling it a night. Many options were offered to us including an open-air movie screening. We finally opted for one of those hookah lounges under a clear sky full of stars. We ordered a tea kettle for two while the waiters obviously did not know what boiling water meant. After two attempts of getting warmer tea, we finally gave up and drank it anyway. At some point during our tea session, we heard two big splashes coming from behind us. We turned and looked only to notice it was two drunk dudes who suddenly decided to jump from the second-floor patio into the pool located on the ground floor. Just another classic demonstration of human stupidity. Blame it on the alcohol? I don’t think so! On that note, we paid and left the lounge. We walked back to our accomodation dodging all sorts of oddballs such as flyer girls in short skirts, people dancing on open-air dancefloors, waiters inviting us to overpriced seafood feasts and, of course, more drunk dudes. We finally made it back into our rooms. Luckily, we couldn’t hear the loud music blasting off the bars from our quarters. Win! As mentioned, despite its reputation of party island, what really brought us to Gili T was the quality of its aquatic echosystems. Consequently, Cath and I have planned three dives at different sites around the island. For all three dives, we always started from “Vila Ombak Divers” where we would get ready to leave with the dive center’s boat. All the necessary gear was already embarked by the crew and all we needed to carry with us was our fins, mask and weight belt before leaving for adventure. The chosen sites to dive into highly depended on the day’s weather conditions and stream strenght. Among the three dives we made, two of them were really enjoyable during which I had the chance to swim with the strangest and most colorful kinds of fish - some sporting colors so bright I did not even know existed in nature. I also had the immense priviledge to swim with giant turtles, saw live anemones with clownfish, observed a handful of sharks resting in an underwater cave and, on the last dive, I even witnessed a bank of nine rays majestically floating about 10 meters over my head. Alexis, my divemaster was particularly enchanted to see such an amazing spectacle. Believe it or not, throughout his countless dives he had never had the chance to witness so many rays moving together. Those memorable dives at 18 meters deep made my stay on Gili T the highlight of my travel and abundantly compensated for the island’s poor landscape. On our last evening together, the four of us went for one last dinner at the night market where tons of different local flavors were to be tasted. We ended the evening with a cup of homemade ice cream prepared before us in a very entertaining way. 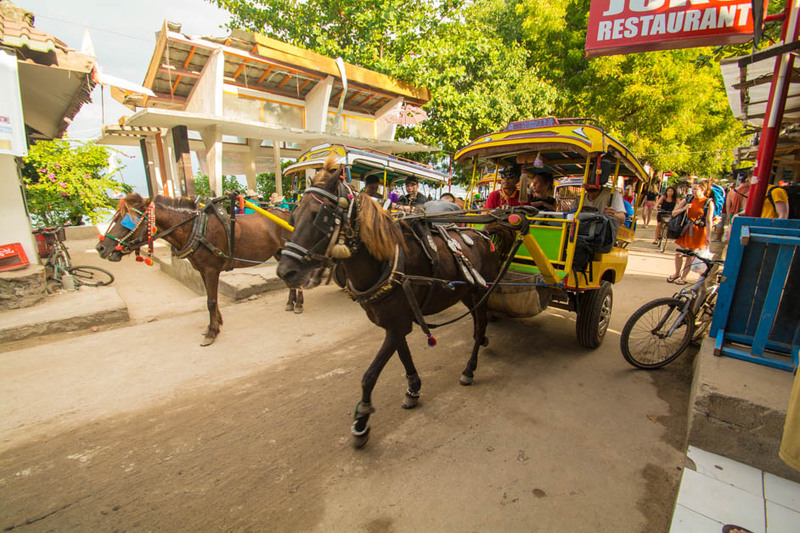 As you can see, there is much more to discover while visiting Gili T. Only, you must not “get cold feet” about exploring sights outside of what the island is famous for.